This spacious house has custom art and furniture throughout that we loved making and are excited to share with you! The gourmet kitchen, movie room, foosball table, BBQ and fire pit are perfect for summer evenings. 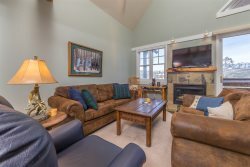 Recently renovated, this 1920 home has a lot of character that is perfect for families, travelers with dogs, and larger groups that want space to spread out and relax as they take in all that Bozeman, Big Sky, Yellowstone and the surrounding areas have to offer. It is a great location on a residential street that is only a short walk from downtown shops, restaurants and the Montana State University campus. We are also one block away from Cooper Park – one of the larger off-leash dog parks in the area. The house comes ready with all the amenities for your stay. The kitchen is stocked with the essentials as well as some pantry items, a coffee maker and French press, panini press, and even a KitchenAid mixer! There are three private bedrooms that each sleep two, as well as three couches and a queen air mattress. The large fenced back yard is perfect for dogs or kids, and has a large grill so you can host that perfect summer dinner party or enjoy a quiet evening under the clear night sky--if you haven't seen a sunset or starry night in Montana yet, you're in for a treat! The pictures don't do this place justice. Super cute, clean, thoughtfully appointed, and walkable to lots of great stuff. We had two little ones with us and were beside ourselves about the secret surprise playroom. Awesome spot! The house was exactly as pictured. The kitchen was well equipped with modern appliances, many dishes and pots and pans. The location in the Cooper Park historic area was perfect. The host was very quick to respond to any of our requests. We would recommend this house to anyone. We had a great stay in Bozeman! Beautiful house within walking distance to many restaurants and shops. The house had all the amenities needed for a comfortable stay. I would recommend this place to anyone traveling with a group or kids. We loved this house. I stayed at this house with 7 girlfriends from college. We were in town for a mini-reunion. The layout of the house was perfect for our group. Loved having lots of bathrooms to get ready and space to hang out and visit. This place is also very centrally located, close to downtown (walking distance) and campus. Highly recommend this place! Great, central spot for our Bozeman work trip. Spacious, comfy, plenty of bathrooms-- and if we hadn't been so busy with work, we would've loved spending more time in the lovely backyard and on the super cozy couch downstairs. Everything we needed, plus some! Beautiful home and such a wonderful location . Our host Chris did an excellent job with any questions we had. You will love the yard and the convenience of this well cared for home . Walking to town and dog park was so much fun !